Bridge experts are evaluating the safety of the Martin Olav Sabo Bridge in Minneapolis to determine when the pedestrian and bicycle crossing can reopen. City crews Thursday completed installing support structures beneath the bridge, where a suspension cable connection broke loose late Sunday. Crews also released tension from a second pair of compromised cables. Minneapolis crews plan to remove the compromised cables on the Sabo bridge Friday. Inspectors are working methodically to assess the bridge's condition, strength and ability to handle movement, Assistant Hennepin County Public Works Administrator Debra Brisk said. Investigators are also inspecting the remaining cables along the bridge. "They are being very cautious, because one little error and you may have some cables that are flying or you could have something happen to the bridge itself," Brisk said. The city and county brought in Illinois-based Wiss, Janney, Elstner Associates to help investigate the Sabo bridge failure. The contract for forensic engineering stipulates the cost won't exceed $100,000. The firm has expertise in emergency investigations, and also investigated the 35W bridge collapse in 2007. That is also the same year the Sabo bridge was built. 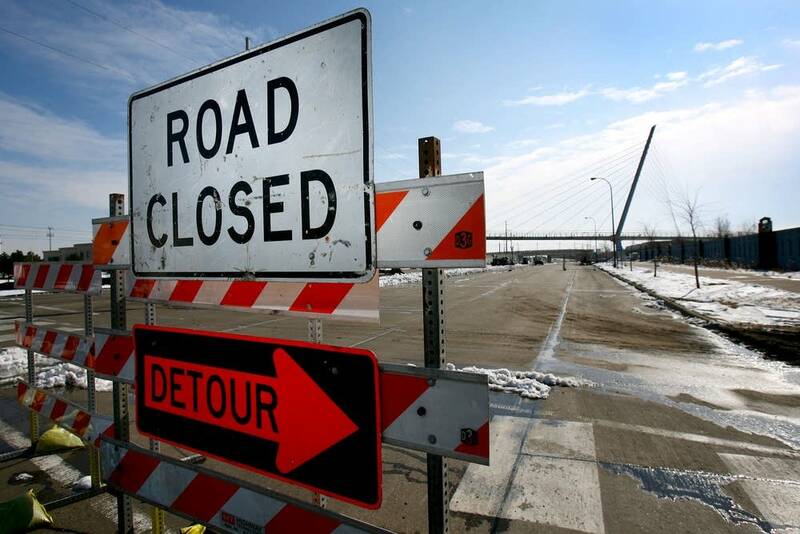 Documents obtained by MPR News show inspections of the $5.1 million Sabo Bridge in October 2011 by the city's licensed bridge inspectors found the span's superstructure, cables and supports to be in good condition. That a bridge less than five years old would have problems is surprising to New York-based bridge engineer Andrew Coates, partner and chief technical officer for Hardesty & Hanover. He said investigators will have to determine what caused the cable support to fail. "Poor construction or fabrication, a weld wasn't made right. There could be a fatigue issue due to vibrations caused by wind or something else," Coates said. "You know, the classic fatigue thing is you bend a paperclip back and forth until finally you break it." San Francisco-based URS Corp. consulted on the design of the cable-stayed bridge. That's the same company that consulted on the 35W bridge. The Sabo bridge was built by Burnsville-based Ames Construction. Neither Ames nor URS returned calls seeking comment. The Sabo Bridge is the only cable-stayed bridge in the state. The federal government does not track how many other cable-stayed pedestrian bridges there are across the country. 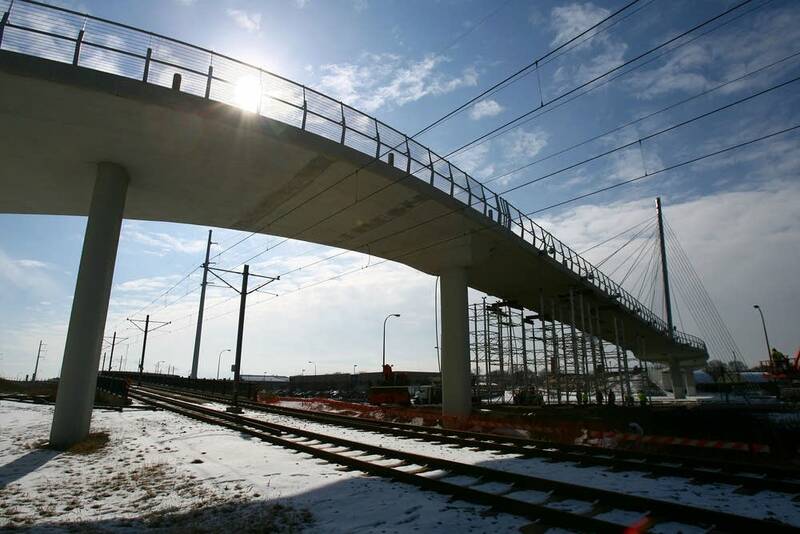 In 2007, there were around 30 cable-stayed vehicle bridges nationwide. Minnesota state bridge engineer Nancy Daubenberger says any issues uncovered by the investigation of the Sabo bridge will be helpful. "It is a bridge design that has a very high aesthetic value. I think cable bridges in general are viewed as very aesthetic bridges and there's been success with cable designs across the country," Daubenberger said. There is no reason it shouldn't have been considered here. It's just something we need to know more about." City officials say it is unclear how long the investigation could take. While it continues, the city is diverting traffic on Hiawatha Avenue. 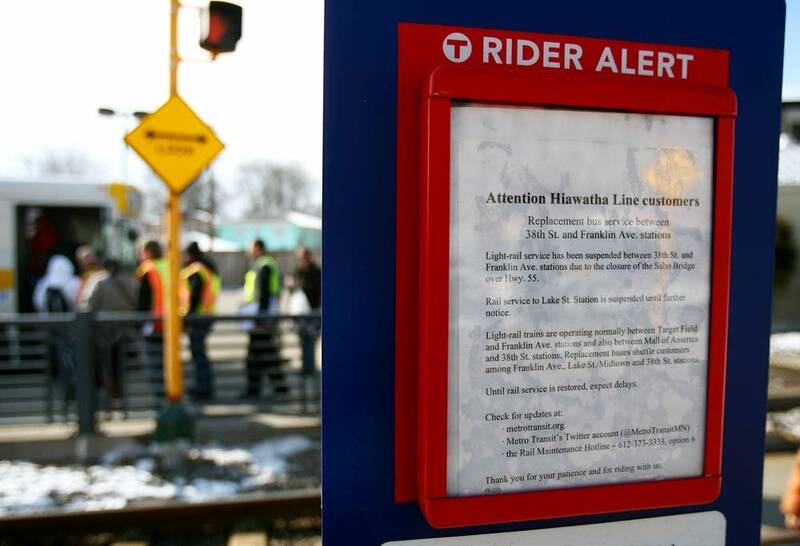 The Lake Street stop on the Hiawatha light rail line remains closed. Shuttle buses are replacing light rail service between 38th Street and Franklin Avenue.